I’m in the clear minority of viewers that thoroughly enjoyed Marvel’s Iron Fist on Netflix. Yes, the basis for the story (and the comic book it is sourced from) are problematic. Yes, the show is far from perfect. But in reality, Iron Fist is right on par with the rest of the Marvel productions on Netflix. And I am able to overlook the problematic nature of the show because I, like any die-hard Marvel fan, know that I often have to forgive the simplistic and overly white components of these storylines in order to enjoy nearly any comic book property. Since before Marvel’s Iron Fist even debuted on Netflix, the outcry over the series has been overwhelming. Whitewashing criticisms were even being hurled before the lead character Danny Rand, played by Finn Jones, had been cast. And rightfully so. The Iron Fist comic book has a long storied history of appropriating Asian culture and resting heavily on antiquated and backwards minded stereotypes (just like Luke Cage). And miraculously, that same problematic character that debuted in the 70’s at the height of martial arts movies continues in comics today. One of the biggest criticisms that people have lobbed at Iron Fist is that it’s all about a rich white guy who appropriates culture to become a hero. But if we’re really honest, that has been one of the oldest tropes used in comics. The most obvious case is Batman (Bruce Wayne). Orphaned after his parents were killed in a robbery, the very rich Bruce Wayne grew up resentful and vengeful for what he lost. So, he sought out martial arts masters and sunk a bunch of money into super high-tech weapons. Ta-da. Superhero. Just like Batman, Iron Man (Tony Stark) is another rich man’s sob story where the solution to everything is the rich white man’s privilege that they were born into. But in Tony Stark’s story, his great innovation came with the vital intellectual input of an Asian character, who coincidentally sacrificed himself so that Tony could live. For an added bonus he was able to maintain his wealth despite having a storied problem with alcoholism, legendary womanizing, and having the entire public know that he is the man that pilots the Iron Man armor. Another of the big criticisms that I’ve heard of Iron Fist‘s hero is his immature attitude. But Doctor Steven Strange suffered from that same smug arrogance without being kidnapped as a child or removed from society for the majority of his formative years. Doctor Strange (Steve Strange) is yet another wildly successful white man, his startlingly precise surgical skills being his claim to fame, who turned his own personal sob story into a career as a superhero. Just like Iron Fist, he too studied under Asian masters and in turn became a master himself. Guess we should all be lampooning this comic book property too. Talk about problematic origin stories. Most people know that Steve Rogers was transformed into Captain America after an experimental procedure from a defector Nazi scientist. What many don’t know is that 300 Black men were subsequently tested on in an attempt to recreate the formula that made Steve Rogers the living symbol of America. Only one survived, Isaiah Bradley, and despite being equal to Captain America in every way, he is largely an unknown outside of the Black superhero community. Whiteness much? The Netflix series centered around this character was widely lauded by Black audiences (including us). But if we’re being honest, this show is highly similar to Iron Fist. Luke Cage has his own problematic past, as the result of his own round of experimentation while wrongfully incarcerated, and he stumbles through the 13 episode first season making some not so intelligent choices against villains with nonsensical or cloudy motives. While the show did a much better job depicting women than the comic, this franchise still has issues with Black Respectability politics. One of the parts of Iron Fist that I enjoyed most was how it empowered women characters. Joy Meachum was a bauce of a business woman. Claire Temple is the one person equipped to heal superpowered people, and at times, she was the most clear-headed person on the team. And Colleen Wing was an incredibly formidable fighter who wouldn’t stand for being seen as less than anyone else. But Wonder Woman? She literally fights evil in a bathing suit and one of her powers is to compel people to tell the truth. I’m not saying she isn’t dope. But, what I am saying is that the comic is written in a way that objectifies her from the outset. If we aren’t talking about that now (ahead of the June release of the new film), then we really shouldn’t be complaining about Iron Fist. People love to say that Danny Rand came in and stole the Iron Fist status and powers, that the Iron Fist was meant for someone else. That happens to also be Green Lantern’s exact backstory, except he didn’t actually earn anything. Hal Jordan was just in the right place at the right time to get his supernatural powers from a dying alien. At least Danny Rand had to go through years of trials to earn his abilities, abilities that he was chosen to receive by the way. Deadpool is an overt misogynist anti-hero. He makes jokes about anatomy. He kills with no regard. He treats women like trash. How you can champion him but be critical of Danny Rand, a hero who is dedicated to protecting those who tend to have no protection, is beyond me. Once again, Green Arrow is Oliver Queen, another rich white man with a massive chip on his shoulder. He is a major womanizer, has children he isn’t even aware of, and allows his personal demons to bring about actual harm to the people around him. And I’m not even sure his abilities are great enough to redeem any of that. These heroes really aren’t perfect heroes. Nowhere near it actually. And many of these franchises have been converted into highly successful films and television shows. I say all of this to point out that the majority of our comic book faves are problematic. And more often than not, our own prejudices direct whether we can stomach the troubled origins of certain comic book characters. If we’re honest with ourselves, we can agree that this is the reason why so many people are being hard on Marvel’s Iron Fist. Not because Finn Jones didn’t do a good job of portraying Danny Rand – because he did an admirable job in what must have been a difficult role. It’s not because the characters weren’t compelling – because the women characters are strong and nearly just as important to the show as Danny Rand. And it definitely wasn’t because the fight scenes were terrible – because even though they started out rough, you cannot deny the artful brilliance that was Colleen sword fighting Bakudo in the rain. That was good graphic novel television. 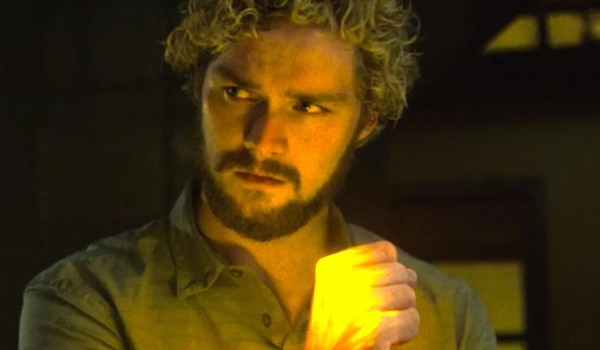 No, people are critical of Marvel’s Iron Fist because they have chosen not to suspend their disbelief in this particular case (Finn Jones has a specific idea about why that might be happening). I watched Marvel’s Iron Fist with an open mind and found that if you can suspend your disbelief just like we do for any of these other comic stories, you’ll find the series to be an enjoyable, meaningful story about deciding between duty and destiny. You may do the same and still hate the show. But, I would at least give it a try before jumping to any conclusions.